Great AZ-102 exam questions will help you complete Microsoft Azure Administrator Certification Transition. AZ-102 exam is intended only for candidates who have taken exam 70-533 Implementing Microsoft Azure Infrastructure Solutions for Azure Administrator Associate certification. 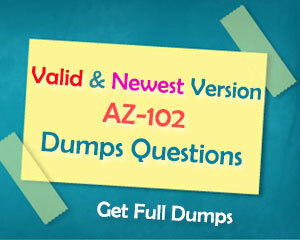 So now just take AZ-102 exam with great 1Z0-102 exam questions. AZ-102 exam is available for a limited time only and is scheduled for retirement on 6/30/2019. Humongous Insurance is an insurance company that has three offices in Miami, Tokyo, and Bangkok. Each office has 5,000 users. Humongous has a single-domain Active Directory forest named humongousinsurance.com. The functional level of the forest is Windows Server 2012. – A virtual network named AllOffices-VNet that will contain two subnets named Subnet3 and Subnet4. 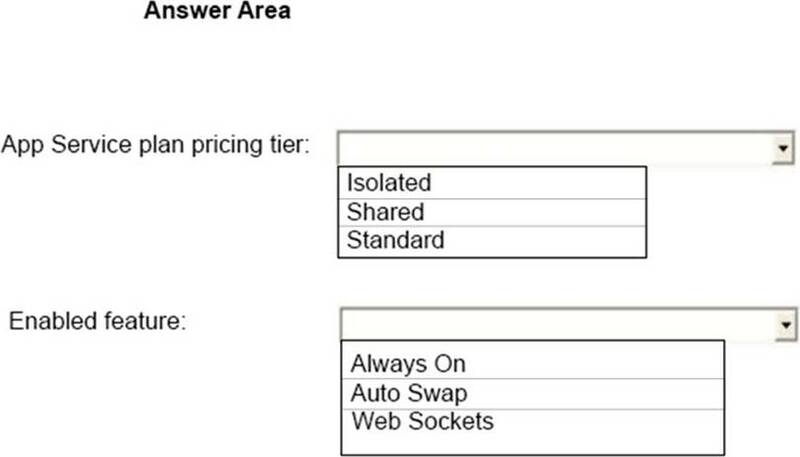 Each subnet will contain several virtual machines that will run either Windows Server 2012 R2. Windows Server 2016, or Red Hat Linux. – Web administrators will deploy Azure web apps for the marketing departments. Each web app will be added to a separate resource group. The initial configuration of the web apps will be identical. The web administrators have permission to deploy web apps to resource groups. – During the testing phase, auditors in the finance department must be able to review all Azure costs from the past week. B. Add http://autogon.microsoftazuread-sso.com to the intranet zone of each client computer in the Miami office. E. Install Azure AD Connect on a server in the Miami office and enable Pass-through Authentication. 2. You need to define a custom domain name for Azure AD to support the planned infrastructure. 3. Which blade should you instruct the finance department auditors to use? You are evaluating the name resolution for the virtual machines after the planned implementation of the Azure networking infrastructure. For each of the following statements, select Yes if the statement is true. Otherwise, select No. 5. http://www.fabrikam.com will be load balanced across Pool22. – ER1 must route traffic between the New York office and the platform as a service (PaaS) services in the East US Azure region, as long as ER1 is available. – ER2 must route traffic between the Los Angeles office and the PaaS sevices in the West US region, as long as ER2 is available. – ER1 and ER2 must be configured to fail over automatically. App2 must be able to connect directly to the private IP addresses of the Azure virtual machines. App2 will be deployed directly to an Azure virtual network. – The cost of App1 and App2 must be minimized. – The transactional charges of Azure Storage account must be minimized. You need to provision the resources in Azure to support the virtual machine that will be migrated from the New York office. You need to implement App2 to meet the application? To answer, select the appropriate options in the answer area. 8. Note: This question is part of a series questions that present the same scenario. Each question inthe series contains a unique solution that might meet the stated goals. Some question sets mighthave more than one correct solution, while others might not have a correct solution. After you answer a question in this section, you will NOT be able to return to it. As a result, thesequestions will not appear in the review screen. You manage a virtual network named Vnet1 that is hosted in the West US Azure region. VNet hosts two virtual machines named VM1 and VM2 run Windows Server. You need to inspect all the network traffic from VM1 to VM2 for a period of three hours. Solution: From Azure Network Watcher, you create a connection monitor. Does this meet the goal? 9. Note: This question is part of a series questions that present the same scenario. Each question inthe series contains a unique solution that might meet the stated goals. Some question sets mighthave more than one correct solution, while others might not have a correct solution. You manage a virtual network named Vnet1 that is hosted in the West US Azure region. VNet hosts two virtual machines named VM1 and VM2 run Windows Server. You need to inspect all the network traffic from VM1 to VM2 for a period of three hours. Solution: From Azure Monitor, you create a metric on Network In and Network Out. Does this meet the goal? 10. Note: This question is part of a series questions that present the same scenario. Each question inthe series contains a unique solution that might meet the stated goals. Some question sets mighthave more than one correct solution, while others might not have a correct solution. You manage a virtual network named Vnet1 that is hosted in the West US Azure region. VNet hosts two virtual machines named VM1 and VM2 run Windows Server. You need to inspect all the network traffic from VM1 to VM2 for a period of three hours. Solution: From Performance Monitor, you create a Data Collector Set (DCS). Does this meet the goal? 11. Note: This question is part of a series questions that present the same scenario. Each question inthe series contains a unique solution that might meet the stated goals. Some question sets mighthave more than one correct solution, while others might not have a correct solution. You create an Azure DNS zone named contoso.com, and then you add an A record to the zone for a host named www that has an IP address of 131.107.1.10. You discover that Internet hosts are unable to resolve www.contoso.com to the 131.107.1.10 IP address. You need to resolve the name resolution issue. Solution: You modify the SOA record in the contoso.com zone. 12. Note: This question is part of a series questions that present the same scenario. Each question inthe series contains a unique solution that might meet the stated goals. Some question sets mighthave more than one correct solution, while others might not have a correct solution. Solution: You modify the name servers at the domain registrar. 13. Note: This question is part of a series questions that present the same scenario. Each question inthe series contains a unique solution that might meet the stated goals. Some question sets mighthave more than one correct solution, while others might not have a correct solution.